Rotary Club of Hexham - welcome! Please scroll/swipe down through this page to find out more about us, in addition to the pages linked in the menu, top-left. We meet at 12.45 for lunch each Monday at the Beaumont Hotel, Beaumont Street, Hexham, except for the second Monday of each month, which is an evening meeting at the Beaumont at 18:30, and the last Monday of each month, which is an evening meeting at the Priors Hall, Hexham Abbey, at 19:00 for 19:30. At most of our meetings the meal is followed by a guest speaker, who might talk about a Rotary issue, a local initiative, a charity, fundraising or service opportunity or any topic that might be of interest. Recently we've had fascinating talks by Saul Rose (Song Man in the play War Horse) and SIr Michael Darrignton (Greggs). The first Monday of each month is usually a business meeting, when each team reports on its activities. The Beaumont has requested that members advise them on a meeting by meeting basis of their attendance at Club meetings. If a member cannot attend a meeting, he/she must notify the Hotel either through email or telephone by the Sunday evening before the meeting. If a member fails to cancel a meal, the club will be charged and the cost passed on to the member concerned. Members are directed to the web site Hexham Rotary for the latest information on the club, including the Club's magazine. 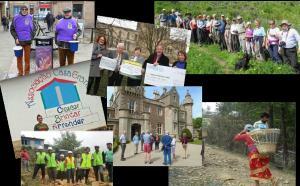 Hexham Rotary Club welcomes applications for funding from charities or individuals working on charitable projects. Further details are available on the 'What we do' pages under Grant Application Procedure. If you are purchasing items through Amazon, please do so through the link on this page to benefit club funds. The Club also has an arrangement with Riviera Travel, providing the Club with a percentage of the booking from a Club member.